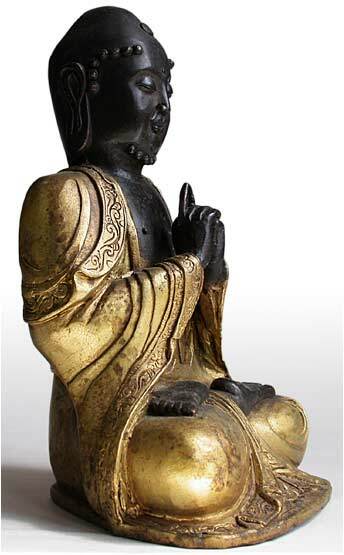 Arhat Bhadra (T. Sangpo) was born in Kapilavastu, the native land of the Buddha Shakyamuni and is referred to as a cousin of the Buddha. 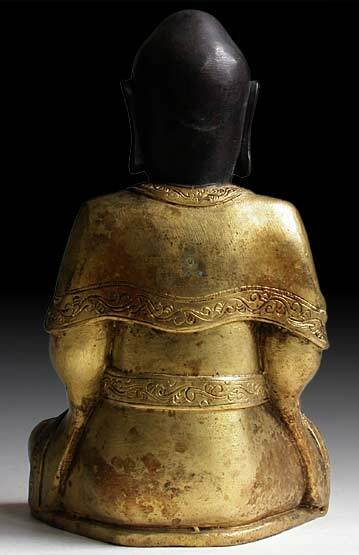 He is represented in Chinese bronzes as far back as the 15th century, when the Ming Dynasty emperor of the Yongle period (1403--1425) contributed personally to the development of the imperial workshop. Bronzes from that workshop established a geometric simplicity that influences even this 20thcentury work. 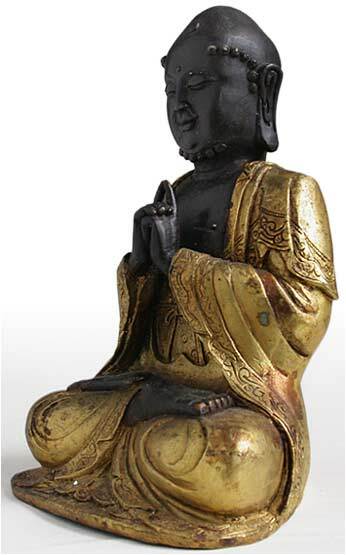 In this fine casting, in which the dark patina of face, hands and feet contrast handsomely with the polished metal of the robes, Arhat Bhadra is seated in full lotus posture deep in meditation, dressed in a long dhoti tied below the chest in a bow and outer robes with embroidered edges falling in graceful folds. 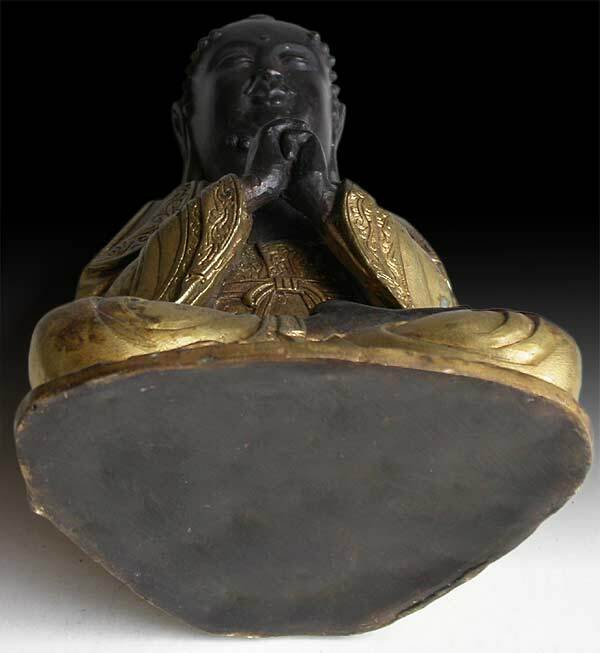 He is depicted in the kanjo-in mudra, which is used in a ceremony of unction affirming that the aspirant has accomplished a given step toward bodhi and hence is further engaged on the path toward supreme enlightenment. 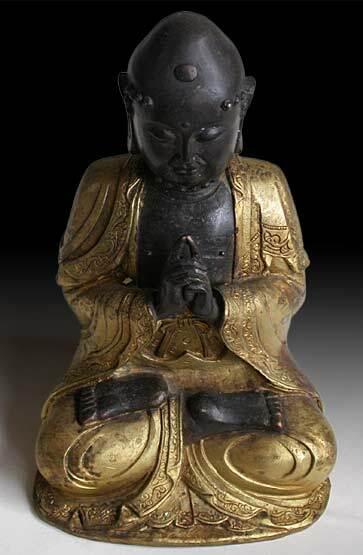 With this gesture the spiritual master “bestows” upon the celebrant the Buddha’s great mercy, enabling him to obtain the highest perfect Enlightenment. 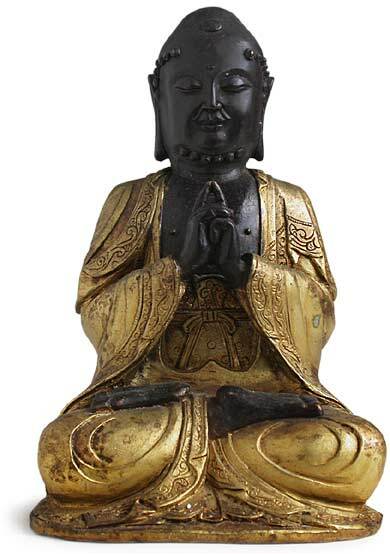 The statue work captures the nobility of the master, its subject; the black finish and crisply carved features are reminiscent of Gandharan style. The curling locks around the head, and the curling beard are characteristics usually depicted, as is the swelling usnisha.